Even if you travel to Hatteras just to go scuba diving, eventually you will need to know about other things to do on the island. The truth is we occasionally get blown out and you are going to need a fallback plan if you don't want to sit in your hotel room watching The Weather Channel. 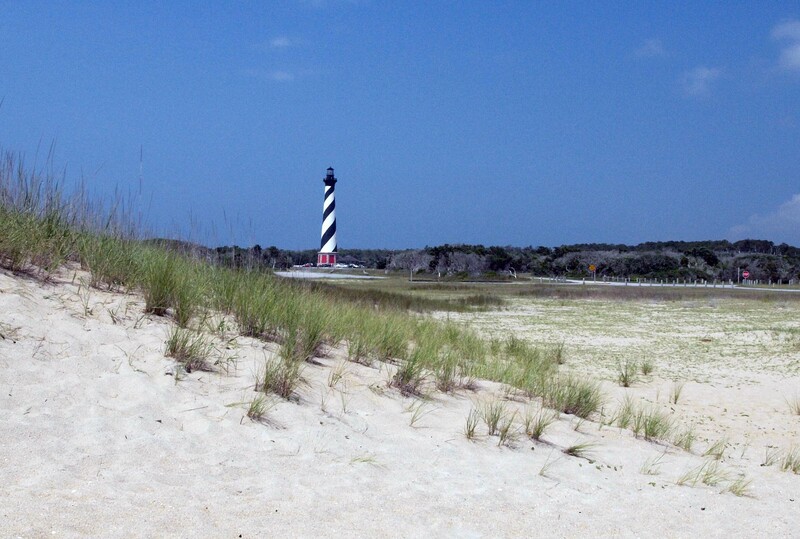 Make the best of it and get to know Hatteras Topside. 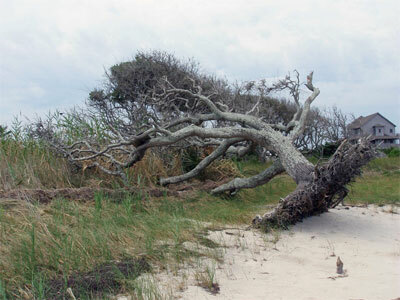 The Outer Banks of North Carolina is a series of barrier Islands (Roanoke, Hatteras, Ocracoke, Portsmouth) that are connected by the common thread of Rt12. We spend most of our time on Hatteras Island from Avon (MP50) to Hatteras Village (MP70) so we are more familiar with things to do and see at the southern end of Rt12. Here are some alternative activities for you and your family if the weather prevents diving. What would your trip to the OBX be without a visit to at least one of the famous lighthouses that have helped keep mariners off the beach for over one hundred years. The Outer Banks Lighthouse Society has an excellent website with information about all of the coastal and inland lighthouses that might be of interest. 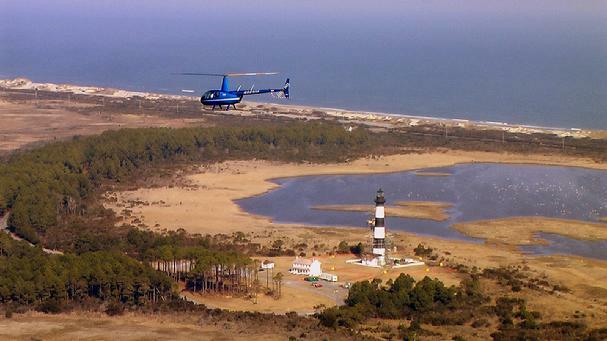 The National Park Service allows climbing of the Cape Hatteras light, but not the Ocracoke or Bodie Island lights. 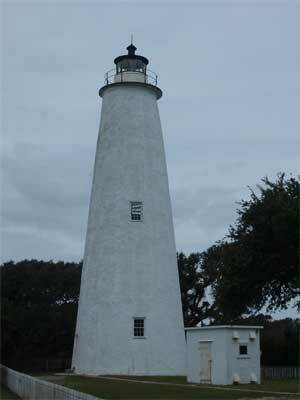 Ocracoke Island also has a lighthouse; to get there, you will need to take the ferry. This is easily accomplished on a day trip and Ocracoke has some pretty good restaurants too. You owe it to yourself to climb the lighthouse. It's a very special structure having a great view of the island, including Diamond Shoals. Located in Buxton, the lighthouse is easy to find, has plenty of parking, and a pretty good shop with all kinds of neat stuff to buy. IMHO, one of the better shops to buy anything from books to star-gazing maps to the usual Black beard pirate stuff. If you are visiting the Hatteras Lighthouse then you are minutes from the Buxton British Cemetery; it is located on the same road as the lighthouse just a short distance beyond the lighthouse entrance and the parking for the cemetery is well marked. 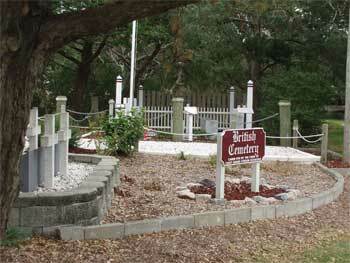 There is another more well known British Cemetery on Ocracoke Island. These two cemeteries hold the graves of British sailors who were killed defending our shores during World War II when their vessels, H.M.S. Bedfordshire and the British merchant vessel San Delfino, were torpedoed by German U-Boats in 1942. 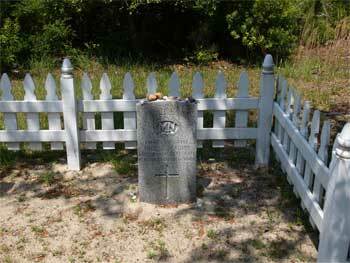 Their bodies washed ashore on Hatteras and Ocracoke Islands and the local Islanders buried them. Remembrance services are held every year in May. Now this little corner of the world is forever England. 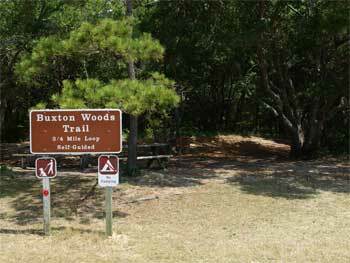 The Buxton Woods Coastal Reserve nature trail is an easy hike on a loop trial. 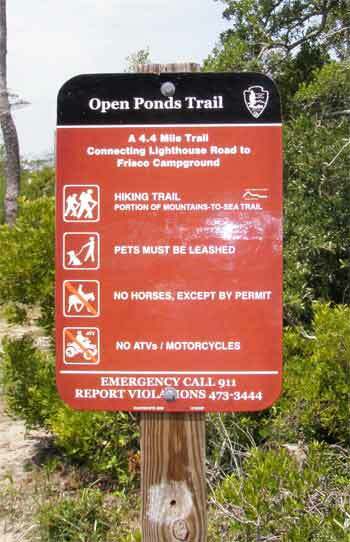 The entrance is just beyond the lighthouse parking area, is well marked, and has a parking area for the trail. This trail has placards identifying the interesting topographical and botanical features as you walk through this section of the maritime forest. In the heat of summer this wooded area feels cooler, seldom has visitors, and is very peaceful. There are many plants and trees that exist here at the extreme northern end of their range and over 135 different species of birds have been cataloged here as well. Many avian species use these woods as they migrate north and south and there is always something of interest here for the bird watcher. A bit further down the road is the entrance to another hiking trail "Open Ponds Trail" which is accessed near the British Cemetery location. This trail is part of the NC Mountains-to-Sea trail system and is about 4.5 miles long if you through hike it through to the Frisco Campground, where you can access the other end of the trail. The trail has some great views of the Buxton Woods maritime forest and is flat easy walking or mountain biking with some sandy sections. Just one word of warning; we hiked it this spring when tall grass covered the trail and encountered more ticks than I have ever gotten hiking anywhere else - we picked up at least 40 to 50 each... Still a nice hike. It's in sore need of refurbishment and is a really good relic even tough we can't go inside. 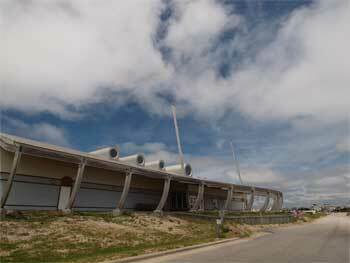 Your trip to Hatteras needs to include a visit to the spaceship. Greetings Earthlings! Located on Rte 12 (left hand if you are traveling south) is our very own Frisco Futuro. Check out one of the many sites devoted to this neat spaceship like structure. 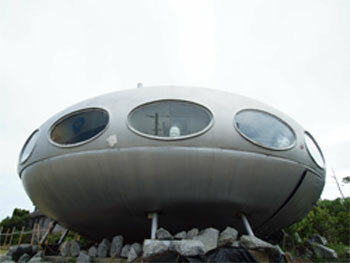 http://www.futuro-house.net/ http://www.futurohouse.com/ , and then visit an authentic one for yourself. This Futuro has served many purposes on Hatteras Island over the years; Originally it was constructed as a family beach house by Lee and Mary Jane Russo and was located on the beach in the area across from Teach Lair Marina and the Ferry docks. There is a story about the construction/assembly of the new Futuro. It arrived on a couple of trucks and the company that was supposed to put it together abandoned the project, so the owners and a group of their friends ended up doing all the construction. After many years of use the family donated it to the Buxton VFD in March of 1983. The VFD was originally going to conduct fire fighter training by burning it down, but decided to make money by raffling it off. The winners of Futuro moved it to the Scotch Bonnet Marina, where it was located at the south end of the parking area near rt12. I remember it being there as the home of the now defunct Hatteras Monitor magazine as well as "Out of this World" hot dog and ice cream place. I do know that it was also lived in when it was at this location. Located next to the Hatteras ferry docks is the newest of Hatteras museums (the only other museum I can think of at the southern end is the Native American Museum in Frisco). Parking is free (! ), as is entrance to the museum, although they happily accept donations. 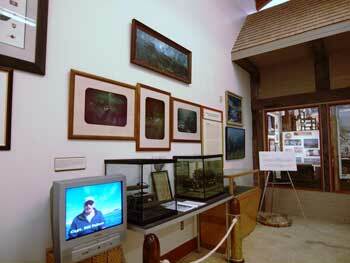 The museum is still a work in progress; however, there are some very nice displays. Of interest to us divers is the U-Boat area which includes an Enigma and other interesting artifacts. Across the street from the museum is a public access to the beach. The water is warmer on the southern beaches and very clean: I know because I snorkel around in the waves on no-dive days. The beaches are also a favorite for shore-fishing. Don't leave your camera or sketchpad at home. 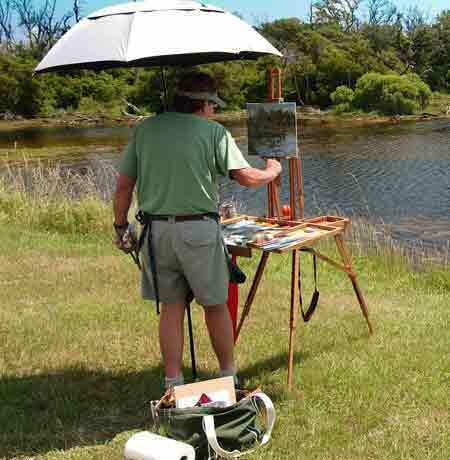 Hatteras Island presents a wonderful opportunity to be creative. I saw this artist painting near the lighthouse. His subject was a small waterway that had lots of wildlife; geese, seagulls, etc., plus about 50 turtles right near the surface poking their noses out of the water. Clearly, the rough natural beauty of this barrier island will not disappoint you. With all of the protected waterways in and around this island, the possibilities for paddling are endless. 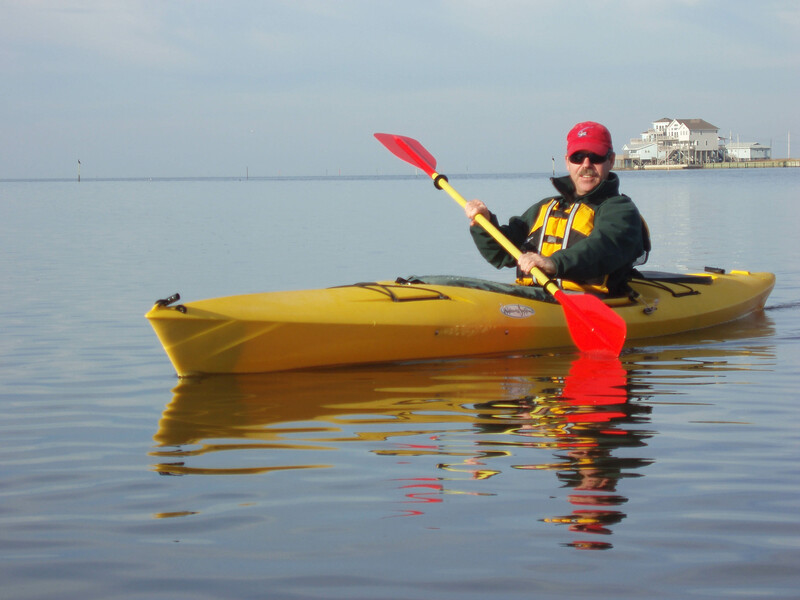 In this photo, Captain Dave paddles in the sound on a beautiful New Year's Day. There are plenty of kayak outfitters throughout the island. If you are unable to get a day of diving in but drove all this way to see a sandtiger, you still can. There is an excellent aquarium north of us in Manteo. From Hatteras Village, its about an hour drive. This is a place to go even if we don't get blown out and if you have the time, its well worth the side trip. 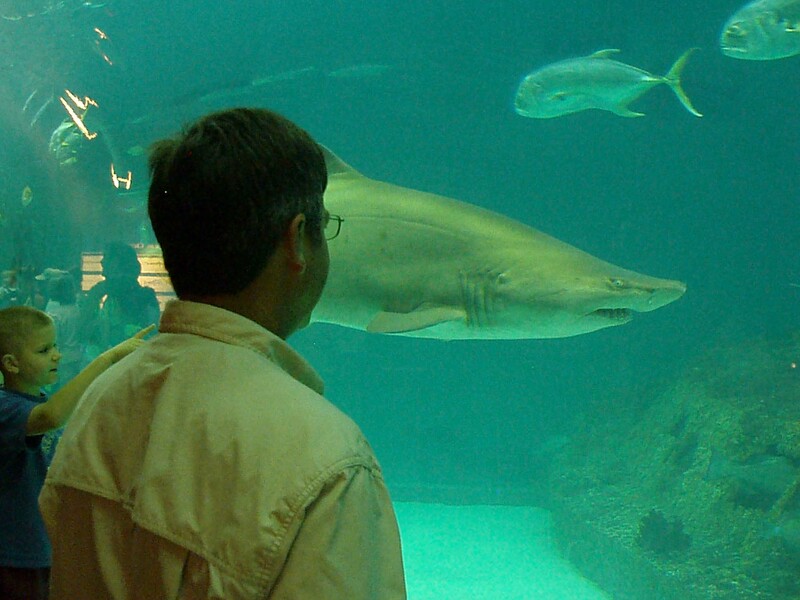 In this photo, Captain Dave enjoys seeing a sandtiger knowing that she's on one side of the glass, and he's on the other. Provides horseback riding on the beach and they know all the cool trails through the woods too. Check out the Bluegrass Jam sessions at the Banjo Island space at the Red Drum Pottery. Located in Frisco on Rt12 just North of the Frisco Center and Post Office, local pickers make some great music every Wednesday night starting at 7pm. They play mainly bluegrass but throw in a lot of other styles too. It can be a just a few locals or a standing room only crowd but the music is always good and your toes will be tapping! It can be a jamb session, so if you are a musician bring your ax and join in the fun. To get a real appreciation of the Outer Banks and the waters of the Ocean and Sounds, go up instead of down! There are two good choices that offer a very different aviation experience. 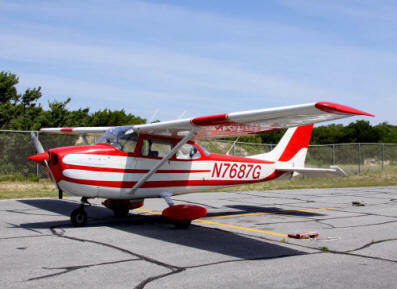 You can fly with Burris Flying Service in their fixed wing Cessna 172 based at Mitchell Field, Hatteras. Or go the Rotor Wing route and get on board with Coastal Helicopters (252-475-4354) in their Robinson R44 for a completely different type of flight experience. All photos are copyright by DiveHatteras LLC.